As we head into the cosiest season of the year filled with pumpkins, hot chocolate and all the twinkling lights, Kathy is going to show you how to get in the autumnal spirit with your gift making! Today, she is going to take you step by step to create a tea light gift box with the First Edition The Gift of Christmas papers to help give your loved ones’ nights a warm glow! 1. Download and print the free template. 2. 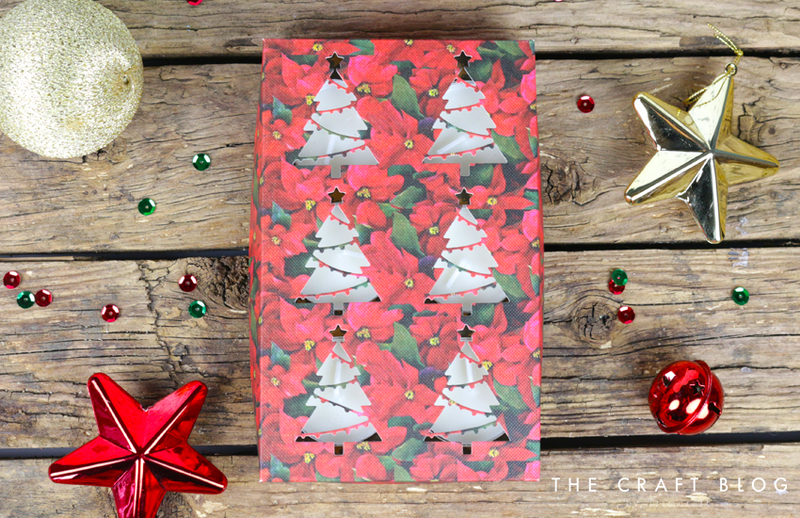 Choose your paper design from the First Edition Gift of Christmas 12x12 paper pad. Follow the template by cutting and scoring as shown to create the box base. 3. Fix the edges of the box base together using Dovecraft Perma Fix tape. 5. Adhere the sides together with Dovecraft Perma Fix Tape and place it inside your box. 6. Cut strips of paper from The Gift of Christmas paper pad, measuring 1.5cm wide and long enough to fit around the tea light bases. Secure with Perma Fix tape. Alternatively you could wrap Dovecraft Washi Tape around the tea light bases. 7. Place the tea lights into the insert inside the box base. 8. Create the box lid following the same steps as shown above. We recommend using the same paper design at the base so the two pieces match. Using the First Edition Trees Dies set, take a smaller die and die cut it six times on to the gift box lid to line up with each of the tea lights. Fix the lid together using Perma Fix tape and place on top of the box base. This would make a great Christmas present for friends and family or you could treat your children’s teachers to a festive gift. How will you use Kathy’s fab idea and our free template? We’d LOVE to see your tea light gift boxes so don’t forget to #trimcraft when uploading to social media and to share your projects in the Inspiration area. Thanks for the inspiration! Making it for sure!